Anna Lee and Will dated for five years, are both Auburn Grads, and planned their Wedding for December in the South. We never know what the weather will be, but wow, it was a perfect day for them. So, for me as a Wedding Planner, there were some firsts, in a wonderful way! Anna Lee wore her Mothers Wedding Dress to the Rehearsal! Not only was it her Mothers beautiful dress, but also her Grandmother wore it in her own wedding, don’t you just love it? I must admit I love southern tradition and this one is perfect. Just to imagine a wedding dress is still intact and such great shape that you can choose to wear it is amazing. The Ceremony was at the Arbor at Aldridge Gardens. Will had family and friends attend from New England, and of course Anna Lee and Will had lots of AU fans present. Another first… for the Wedding Party recessional, the Violinist, Alex Haywood played the Auburn Fight Song as they danced out to the Reception. This surely set the tone for the Reception to come. I love for sure another unique fact: The Bride’s parents are Wedding Photographers. Yes, Robert and Janet Norris were the photographers for their daughter’s wedding! How do you accomplish that? You have another trusted photographer friend help, thanks to Amber Ford for great moments you captured while they were being parents for their daughter’s wedding. 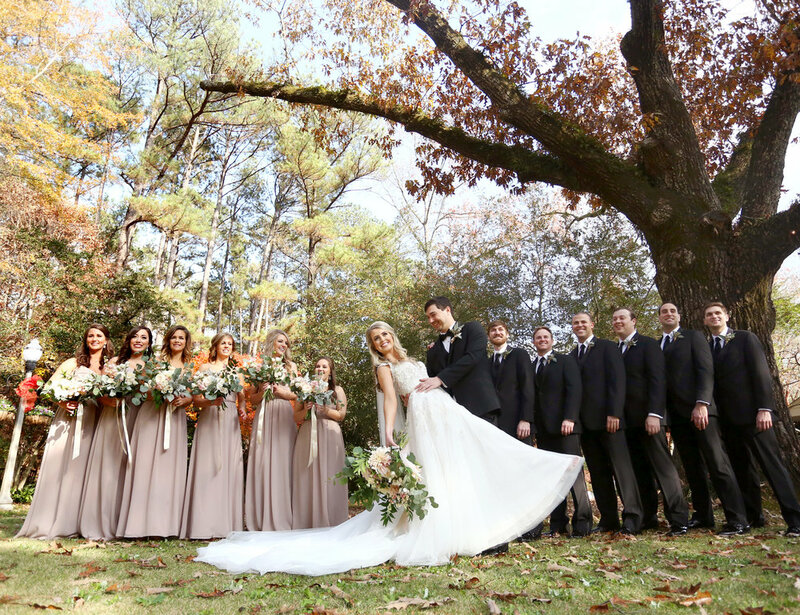 A talented team of Wedding creatives came together creating a perfect wedding day for Anna Lee and Will. Beautiful Anna Lee at her rehearsal dinner in her mother's (and also GRANDMOTHER'S) wedding dress. Southern traditions - It's all in the details! Anna Lee's gorgeous parents! Doesn't that dress look familiar?